The story of birth of Hanuman is related with the story of his mother Anjana. Lord Hanuman was born as the son of Anjana, a female monkey, and Kesari, a male monkey, in the Anjana Giri mountain. Earlier Anjana was an apsara in the court of Lord Brahma. She was cursed by a sage for disturbing his meditation. In her childhood she saw a monkey meditating in his legs folded, child Anjana with excitement threw fruits on the monkey. Suddenly the monkey was changed in form a sage who was disturbed from his tapasya by the act of Anjana. Furious sage cursed Anjana that she would become a monkey when she falls in love with anyone. Anjana begged for forgiveness and pleased sage consolidated her by saying that the man she had fallen love with will love her in spite of her monkey face and also she will be released from the curse when she give birth to a child who will be an incarnation of Lord Shiva. Thus Anjana take birth in the earth to get rid of the curse. Anjana lived in the forest, one day she saw a man and fall in love with him. The moment she fall in love she turned to a monkey. The man came to her and introduced himself as Kesari, king of monkeys. Anjana looked at him and surprised that he was a monkey faced human who has the power to change himself as monkey and human. He asked Anjana to marry him. Anjana and Kesari were married in the forests. Anjana performed deep tapasya worshiping Lord Shiva. Pleased Shiva asked her wish. Anjana said she wanted Shiva as her son in order to get rid of her curse from the sage. Shiva accepted her request. At the other side Dasaratha, King of Ayodhya, was also performing Putrakameshti Yajna for getting children. Pleased Agni Dev given the King sacred payasa and asked to share it among his wives to have divine children. A part of the sacred pudding which the King given to his elder wife Kausalya was taken away by a kite. The Kite dropped the payasa (sweet pudding) where Anjana was performing her tapasya. Mahadeva commanded Vayu, the God of Wind, to place the pudding into the hands of Anjana. Anjana by seeing the payasa happily swallowed it. She felt the blessings of Lord Shiva when she had her pudding. She then give birth to a monkey faced boy who is the incarnation of Lord Shiva and is came to be known in different names such as Anjaneya which means the son of Anjana, Kesari Nandana which means the son of Kesari, Vayu Puthra or Pawanputra Hanuman which means the son of Vayu, the God of Wind. 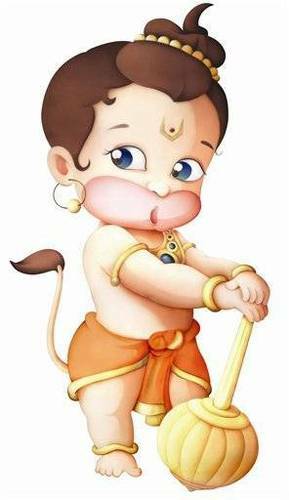 In his childhood itself Hanuman was very powerful. He got the powers of his father Kesari, the mother Apsara Anjana, he is as speed as Wind as he is the son of Lord Vayu. By the birth of Hanuman Anjana was released from the curse and returned to Heaven. Hanuman was one among the Seven Chranjeevis and an ardent devotee of Lord Rama. He had helped Lord Shri Ram to regain Sita from the hands of Ravana the King of Lanka. The story of Hanuman helps us to know about our inborn power that is resting in ourselves.